Breaking news: There will be myriad drug cheats competing at Rio 2016. Medals will be hung around the necks of doped athletes. Some will be found out, others will not. Some will retain those medals for all time. 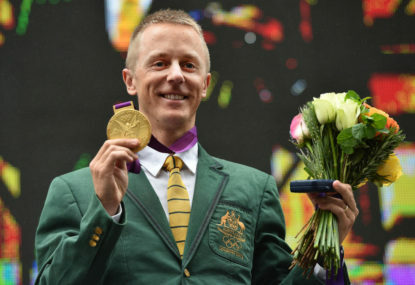 Others will be exposed in the ensuing years as having collected ill-gotten gains, like Russian race walker Sergey Kirdyapkin who was forced to surrender his gold medal to Australia’s Jared Tallent nearly four years after he cheated at London 2012. There is no guarantee that Australia’s 400-plus athletes heading to Brazil will all be squeaky clean. Indeed, this week the Australian Olympic Committee trimmed its team by one with the removal of wrestler Vinod Kumar, who has recently returned a positive drug test. Since drug testing was introduced at Mexico City in 1968 the Games have been tainted by doping. The biggest scandal however was laid bare many years after the event and sadly it resulted in no penalties. It was not until after the Berlin Wall came down in 1989 that the true extent of East Germany’s state-sanctioned and financed doping regime became known. It was discovered that the East German sports system took doping to a whole new level. Investigations post-1989 have spawned many books and documentaries outlining the lengths the country went to in its quest to triumph at various Olympics and world championships through the Cold War era. The Olympic records of that period are forever warped with clean athletes robbed of their moment in the sun. Australia’s Raelene Boyle is a case in point. She won silver medals behind East German Renate Stecher in the 100m and 200m at Munich in 1972. Documentation uncovered later revealed that Stecher chose to scale down her drug use post-Munich in order to reduce the risk of birth abnormalities when she started a family. However, when you peruse any Olympic records today Stecher is still accorded the honour of being a triple Olympic champion. Boyle, meanwhile, has to content herself with the fact that she was robbed. There is still a more worrying aftermath of the East German era and that involves sprinter Marita Koch whose 1985 world record in the 400m – set at a World Cup meet in Canberra – still stands as the official benchmark for the women’s one-lap event. That it does is a disgrace as there exists documented evidence that Koch was a drug cheat. Thirty-one years hence her ‘synthetic’ world record remains the target of all those who run the event. That day in Canberra she also anchored the East German 4x100m relay team that set a world record that lasted 27 years through until the London Olympics. The East German doping system was overseen by the Stasi, the country’s secret police. Their files, liberated for the world to see post-1989, indicated that as many as 10,000 athletes were chemically enhanced. Many of them, in their early to mid-teens, were both doped and duped as they were fed the line that what they were being given was vitamin pills. In recent years, successful class actions have been brought against the German government by female athletes who delivered children with birth deformities as a result of the drugs they were given. While many of them were merely pawns used ruthlessly by the communist regime, many others like Koch did so knowing full well they were cheating. And now, here we are in 2016, and world sport is facing a similar situation. The issue of doping surrounding Russian sport has been bubbling along for a few years but this week the lid was blown off. The report identified that over 8000 samples had been destroyed from athletes across two dozen sports. It was the kind of stuff that corrupted international sport during the East German period. McLaren says given that he had 57 days to compile the report it may only be the tip of the iceberg. Upon the report’s release, IOC President Thomas Bach labelled its findings, “shocking and unprecedented”. No Thomas, it is not unprecedented. It happened similarly decades ago and clean athletes were cheated out of medals. The same will happen again if Russia is allowed to take part in Rio 2016. The IOC is currently assessing its legal options before making an announcement on Russia’s Olympic future later in the week. The time has come to take tough action. If the IOC baulks at blacklisting Russia, the Rio Games will descend into farce with every Russian medal a dagger in the heart of international sport and those who wish to see and believe in clean competition. There is no way that Russia’s appalling doping record should be rewarded with Olympic participation.